Appamide Eye Drops is an anticholinergic prepared as a sterile topical ophthalmic solution in two strengths. Primary packing - 5ml Opaque poly bottles White caps & Nozzles. 5ml of solution in White poly bottles with white caps & nozzles in properly sealed. Store between 8ºC to 15ºC.D o not allows freeze. This anticholinergic preparation blocks the responses of the sphincter muscle of the iris and the ciliary muscle to cholinergic stimulation, dilating the pupil [mydriasis]. The stronger preparation (1%) also paralyzes accommodation. This preparation acts rapidly and the duration of activity is relatively short . The weaker strength (0.5%) may be useful in producing mydriasis with only slight cycloplegia. 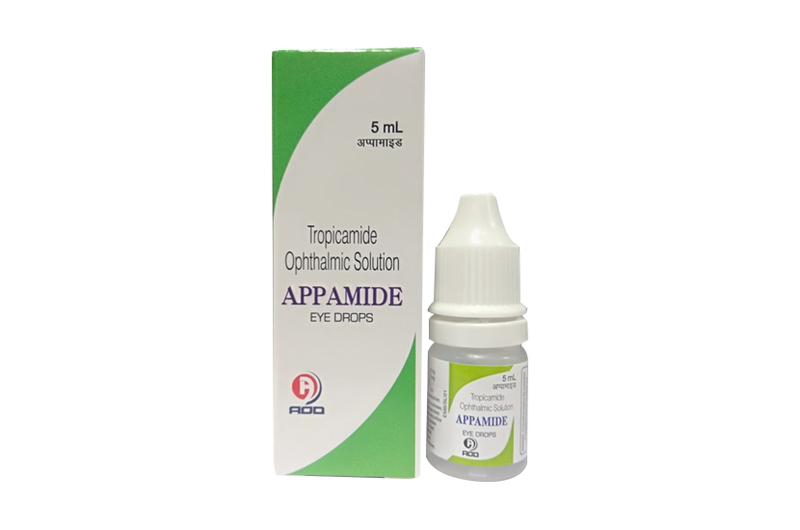 Appamide Eye Drops is used to widen (dilate) the pupil of the eye in preparation for certain eye examinations. It belongs to a class of drugs known as anticholinergics. Tropicamide works by relaxing certain eye muscles. This product is contraindicated in persons with primary glaucoma or a tendency toward glaucoma (e.g. narrow anterior chamber angle), and in persons showing hypersensitivity to any component of this preparation. For topical use only - not for injection. Reproductive studies have not been performed in animals. There is no adequate information on whether this drug may affect fertility in human males or females or have a tetratogenic potential or other adverse effect on the fetus. This preparation may cause CNS disturbances which may be dangerous in pediatric patients. Possibility of occurrence of psychotic reaction and behavioral disturbance due to hypersensitivity to anticholinergic drugs should be borne in mind. In the elderly and others where increased intraocular pressure may be encountered, mydriatics and cycloplegics should be used cautiously. To avoid inducing angle closure glaucoma, an estimation of the depth of the angle of the anterior chamber should be made. The lacrimal sac should be compressed by digital pressure for two to three minutes after instillation to avoid excessive systemic absorption. For refraction, one or two drops of the 1% solution in the eye(s), repeated in five minutes. If patient is not seen within 20 to 30 minutes, an additional drop may be instilled to prolong mydriatic effect. For examination of fundus, one or two drops of the 0.5% solution 15 or 20 minutes prior to examination. Individuals with heavily pigmented irides may require larger doses. Appamide Eye Drops is supplied in 5ml Clear Poly bottles packed with printed labeled in a unit carton and, Such 25 Carton Packed in a Shrink Sleeves.Such 12 shrinks packed in a shipper.